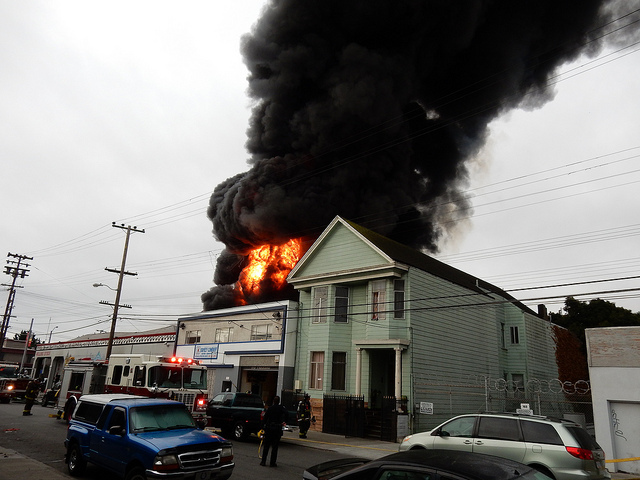 After a fire that destroyed the Rolling Stock tire shop on 16th and Shotwell streets partially consumed their homes, some 29 tenants at 2878 16th Street are in a holding pattern while nonprofits and city agencies try to find them a place to stay until their units are repaired. If other recent residential fires are any indication, that could take years. The group of tenants includes six children. While many were put up at hotels through the Red Cross, the effort will only tide them over temporarily. Others found shelter with friends or relatives. Mission Promise is one of several community groups that are currently assessing the tenants’ needs in an attempt to provide services and resources. Martinez spoke with most of the displaced tenants during a meeting organized by the Red Cross on the day after the fire. While many were in shock – the incident seemed to not have sunken in yet, said Martinez – others were visibly distressed. Bridging the gap from the fire to getting tenants back into their apartments, he explained, is a challenge currently faced by the City as well as the Salvation Army and other organizations providing relief. Maria Zamudio, a housing advocate at Causa Justa, is working with the tenants to ensure their rights are protected throughout the process of recovering from the fire. “The 22nd/Mission fire set a really bad precedent for this kind of mass fire displacement in the Mission. We’ve been seeing that fires happen, tenants get displaced, they have a very unclear timeline for when they can return,” said Zamudio. So far, tenants are finding exactly that. On Tuesday morning, tenants were ready to retrieve their belongings – some had rented U-Hauls, others bought boxes and moving supplies. But, like many other tenants displaced by residential fires, they were informed suddenly that a meeting with their landlord had been canceled, that the building was unsafe and that they could not return. Peter Bratis, the building owner, had met with tenants on the day of the fire and scheduled an appointment for Tuesday so that they could enter the building and retrieve their belongings. However Tuesday morning Bratis’ daughter called and cancelled it, according to tenants. Mission Local was unable to reach either the landlord or his daughter. Lepe suspects most of the damage will be water-related, and that the longer the tenants have to wait to get in their building, the more will be lost. The Department of Building Inspections deemed the building unsafe hours after the fire, noting that there had been no major structural damage but that plumbing and electrical systems were damaged, as well as the roof and the property line wall. The notice also describes severe dry rot to the rear stairs. A building inspector did not return calls for comment. Despite having lived in the building for years, Lepe said reaching the landlord was always difficult, and the struggle continued after the fire. “Everytime we tried to contact the owner for stuff to be done to the building he would never contact us back. We tried to call him and his number and his voicemail is always full,” seconded tenant Norma Pizarro, who lived in the building with her family. She and her partner, her daughter and daughter’s partner, and two young children are sheltering with extended family. City officials intend to keep the tenants in San Francisco by way of Good Samaritan housing, a city program that encourages landlords to offer temporary housing at reduced rental rates in the aftermath of a disaster. “My plan is to work with Good Samaritan legislation to see if we can get people into empty apartments, just like we did with the 22nd/Mission fire,” said Ben Amyes, emergency services coordinator for the Human Services Agency. Following the January fire that displaced more than 60 tenants, many were placed in temporary city-assisted housing on Treasure island and in Parkmerced. Just a handful were relocated within the Mission. The “Samaritan” landlord would be able to negotiate a short-term lease with the tenants, buying the them time, said Amyes. But the process is not a guarantee, and landlords must step up to make it work. Amyes said he has no control over how long the relocation might take. Next door, the city’s office of economic and workforce development is assisting the displaced business, Rolling Stock, though details of that assistance were not immediately available. Property owner Jim Albera told KTVU earlier this week he would like to build housing at the site after the structure is inevitably torn down, but told Mission Local later that it’s too early to tell and he has no specific plans yet. The property is currently zoned for the light industrial category of Production, Distribution and Repair (PDR). The former tire shop has been fenced off, and subsequently graffitied with the words “ARSON” in huge letters. Supervisor David Campos via Facebook encouraged those who wish to help support the fire victims to donate to the Mayor’s Fund for the Homeless and write in “Shotwell Fire Victims” in the empty field. You can find that link here.